By Beating Australia, Has Virat Kohli Conquered the Final Frontier? Virat Kohli has become the first Indian captain to win a Test series against Australia in Australia, solidifying his legacy and having his name etched in the record books. Could this be the real feather in his cap, the mother of all his achievements so far? irat Kohli is the best batsman in the world. This is no longer an opinion; it is a fact. The statistics and the records speak for themselves. He is the best batsman in Test cricket and the shorter formats. Whether it’s a green top or a dusty track, seam bowling or spin, bright sunshine or overcast conditions, setting a target or chasing one, whether the team is playing in India or overseas, international or franchise cricket, King Kohli has conclusively established his ruthless dominance with the willow. Commentators, critics, and fans have run out of adjectives to describe his feats — his ability, planning, and execution with the bat. He is the Roger Federer of batting. Kohli has the world at his feet. 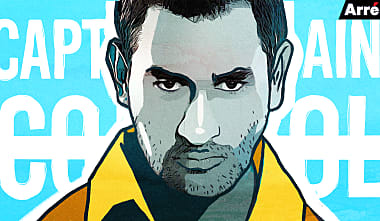 He is the darling of the country, scores runs at will, has brands chasing him, and is India’s richest sportsperson. Last December, he had a dream wedding that gave the world Instagram envy. (At least, until DeepVeer started flooding everyone’s timelines.) One wouldn’t be wrong to believe that he is at the very top in every aspect of his game, from diet to fitness to skill. He is obsessed with success, he’s the “perfectionist” of cricket, if you will. However, there was an area of his game where critics always raised question marks — captaincy. As India win their first ever test series against Australia in Australia, has King Kohli managed to conquer the final frontier? Kohli’s problem had always been India’s eternal problem — winning away from home. Before the Australia tour, we were the No 1 Test side under Virat Kohli, winning 24 and losing nine out of 42 tests. But our dominance had been restricted to Asia and the Caribbean, as Team India struggled this year in both England and South Africa, only managing to win a Test each on both tours. The general belief in cricketing circles was that India are flat-track bullies and do well only at home and in Asian conditions. Much like his predecessors MS Dhoni and Sourav Ganguly, Kohli had done exceptionally well in Asia and the Caribbean, but he and his men had struggled to win against quality opposition like England and South Africa, winning only two Tests and losing six out of the last eight games. Kohli’s moment of sweet revenge has arrived. Virat Kohli has managed to change that statistic, enter the record books and earn legendary, almost godly status in the game. Over the years, India vs Australia has become the defining contest in cricket, as prestigious as an India-Pakistan clash, or The Ashes. The battles on the field have produced some of the most breathtaking moments in the sport’s history — Sachin and Warne’s magnificent duel at the Chepauk, VVS Laxman’s magical 281 in Kolkata and most recently, Cheteshwar Pujara’s stubborn and defiant display with the bat. Fireworks have not been restricted to the bat and ball, with tempers flying high and heated words being exchanged, from the infamous “monkeygate” to the bizarre “brain fade”. Even the current India Australia test series had moments of top class banter, with Rishabh Pant and Tim Paine constantly having a go at each other from behind the stumps. The stage was set for Kohli to make history once again. Captain Kohli was furiously taunted by the Australian team and the media, on his previous tour in 2014. India lost the four-match series 2-0 but Kohli had captured the public imagination with his fine batting performances and stirred the pot with his aggression on the field. He did to the Australians what they had been doing to everyone else, and they did not take it well. His behaviour was debated and discussed at length Down Under: He has been called “the biggest sports jerk of the week” and the “Donald Trump of world sport” by the Australian media. FOX Sports ran a poll for the sports villain of the week where Kohli was compared with animals like a panda, puppy and a kitten. But when it came to the game, India failed to dominate and the Australians basked in glory. Kohli’s moment of sweet revenge has arrived. India outplayed their biggest cricketing rival with bat, ball and on the field, convincingly winning the test series 2-1. The stage was set for Kohli to make history and he did make history, becoming the first Indian captain to win a Test series against Australia in Australia, solidifying his legacy and having his name etched in the record books. It could be the real feather in his cap, the mother of all achievements. Best batsman, best team, best captain, what else is left for Virat Kohli to achieve in the game? Dare I say, a World Cup later this year.